In Heartland Healing for June 2, 2015, we wrote about the swamp of seemingly dangerous energy we’ve created with our Age of Technology. Massive power lines drape the continent, indeed, the world. Long-range Extremely Low Frequency radio waves, dozens of miles long, batter the earth’s crust, core and oceans just for the sake of communicating with our submerged war machines. Our homes course with dirty electricity radiating from the walls, now enhanced by mandated Compact Fluorescent Lights. We microwave our food. (How good a practice could that be since we nicknamed it “nuke,” and “zap”?) We sit with energy-radiating laptops and iPads nestled near our gonads. We handle cell phones that generate powerful signals, pressing them against our brainpan, some of us continually, even as we drive; even though the manuals for such phones warn against the radiation they emit. And our modern cars? Sitting inside one is like sitting inside the containment cell at a nuclear power plant, there are so many sources of radio, magnetic and electronic energy pollution. The very atmosphere is filled with television, communication, radio waves and waves of energy we don’t even know about, continually with no regard for its impact. Too much, too soon. This sea of energy is all around us and it defies common sense to think that all that energy, all new to our planet and our bodies over just the past few decades, has no impact. Earth and its inhabitants have never before encountered such insult without having time to evolve. And in a very real sense, evolution has meant being able to absorb and channel energy rather than block it. Physics and metaphysics agree on one thing: we are not physical matter. We are energy. Dig deeper and deeper into solid matter, down to each atom of the body and further, and we find there is nothing but energy throughout. (Or just ask Yoda.) And examining the impact of energy, we see that it’s only a problem when you block it. To use an analogy, (always an imperfect exercise,) the electricity flowing through the wires in the walls of the building you’re in right now isn’t a problem. But stick your fingers in a socket and block that energy, you’ve got a problem. Same deal with kinetic energy. A truck rolling down the street at 40 mph is no problem. But step in front of that kinetic energy and resist it, you’ve got a problem even Obamacare can’t solve. Resisting energy results in wear and tear and what appears as “solid” matter is evidence. When the energy of water flows down a river, where it is blocked, say by a snag or log or sandbar, a mass of flotsam and jetsam accumulates. Slowing or blocking energy is how matter appears in our universe. In another example, consider a household toaster. 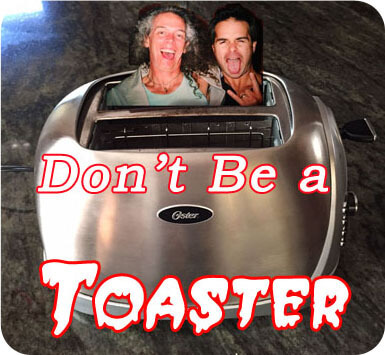 A toaster works by resisting the energy flowing through it, resulting in heat. Anything resisting energy will eventually meet the same fate: transmutation on some level. Go with the flow. So, being swamped by this energy, how can we cope? Resistance is futile. Resistance has always been the Western way, just as in allopathic medicine. But Eastern thought is much more zen. Martial arts recognize that flowing with the energy is the best option. It holds true with our bodies, too. Energy blocking in the body is not a good thing. That should be obvious. On the gross scale of physical awareness, the circulatory system is a good example. That’s a flow of energy in a gross sense. Try blocking that. Or nerve energy. Or food energy. Blocking any of that flow and you have a physical problem. Now evolve enough in your thinking to take it deeper than the obvious. Get down to the cellular or even molecular level. Blocking energy there is problematic, too, and also manifests in larger scale. Now take the idea of blocked energy to the subtler levels. What blocks energy on such a fine level and still manifests physically? Easy answer if you think on it: fear. Fear reaps real results in the physical body. Fear instantly stops digestion, puts a knot in our stomach, a lump in the throat. Fear measurably constricts blood vessels, throttles nerve impulses, even modifies the behavior, structure and metabolism of cells. Fear tries to block energy. Think Love not fear. The wavelengths of energy are many and varied in the universe. After scampering all up and down the electromagnetic spectrum through the gamut of sound, radio, light, microwave, cosmic rays and so on, we eventually can extrapolate that thought is the highest form of energy. To move beyond fear, we must enlist energy on the highest level, then. To move from fear to Love, we must change thought, change belief. Otherwise, we will suffer the fate of the toaster.